When considering a hybrid vehicle, perhaps one of the first things you think about is fuel economy. Then there’s the hybrid battery, which will eventually fail, and do you have any idea how much that costs? The thing about hybrid battery packs isn’t “if” they’ll fail, but “when” they’ll fail. For the most part, dealerships will only offer full replacement as an option. Sure, you’ll get a new hybrid battery, which pretty much guarantees 100% performance and fuel economy improvement, but it also costs a lot. In the case of the world-class and most-popular Toyota Prius, for example, a new Toyota hybrid battery might cost something on the order of $5,000. On the other hand, chances are that the hybrid battery didn’t really need to be replaced in its entirety, but simply “conditioned,” according to the professionals at The Hybrid Shop. Most hybrid vehicles use nickel-metal hydride (NiMH) battery packs, in various configurations, which are very resilient. They rarely ever fail in their entirety, but perhaps lose their balance, that is, one or two modules could be compromised in its capacity and power. After all, just like a chain’s weakest link determines its strength, a hybrid battery is only as strong as its weakest module. The Hybrid Shop has based its hybrid battery conditioning technology on science that’s been thirty years in the making. Actually, NiMH conditioning has been around for a long time, but never applied to automotive-grade NiMH hybrid battery packs. Once put through the conditioning process, most hybrid batteries can be restored to as much as 95% of their factory capacity and power, at perhaps one-fourth the cost of a new hybrid battery pack. Additionally, conditioning the hybrid battery pack, instead of replacing it, eliminates hard-to-recycle NiMH battery components from the waste stream. 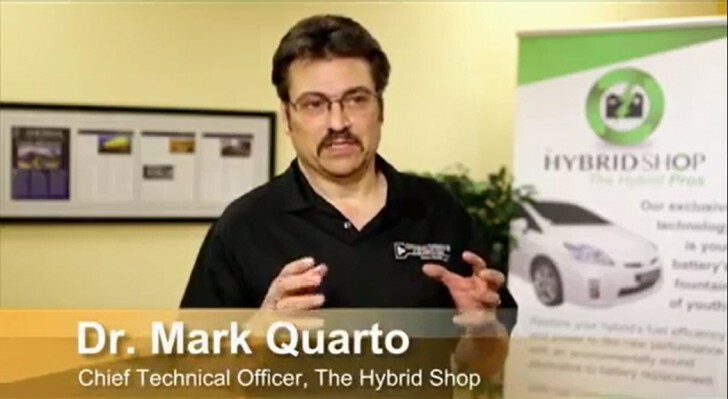 The Hybrid Shop’s world-class hybrid battery conditioning technology saves the customer some green, and is green for the environment, as well as restoring fuel economy and performance to green cars. According to scientist and engineer Mark Quarto, the same NiMH conditioning technology can also be applied to Li-Ion (lithium-ion) battery packs, which may mean that even pure electric vehicles running Li-Ion could benefit from similar technology.